Hotel in prime location near Sea-Tac International Airport with shuttle service. 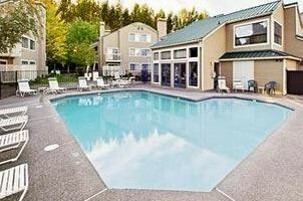 Set at the edge of a commercial area, this relaxed extended-stay hotel is 4 miles from Westfield Southcenter shopping mall and 7 miles from Seattle-Tacoma International Airport. This affordable accommodation is ideal for people visiting for a few days, longer-term stays, and families on vacation. Cap Rate: 8%. Rooms: 150 rooms, 1 and 2 bedroom suites. Occupancy: 75+%. Hotel Amenities: Business center, conference and meeting rooms, fitness room, airport shuttle, self parking and long-term parking, laundry facilities, outdoor pool, restaurant, spa tub and multilingual staff. Building: Built in 1990, net square footage 7,444. Land: Approximately 6 acres in prime location where land rarely comes available, near high-quality commercial area.